Use of the internet continues to grow at a pace. Recent figures from The Office for National Statistics answer the question of 'Why Should a Funeral Director Have a Website?' We can see that internet use in the 65 to 74 age group has increased from 52% in 2011 to 78% in 2017, closing the gap on younger age groups. In Quarter 1 (Jan to Mar) 2017, 89% of adults in the UK had recently used the internet. 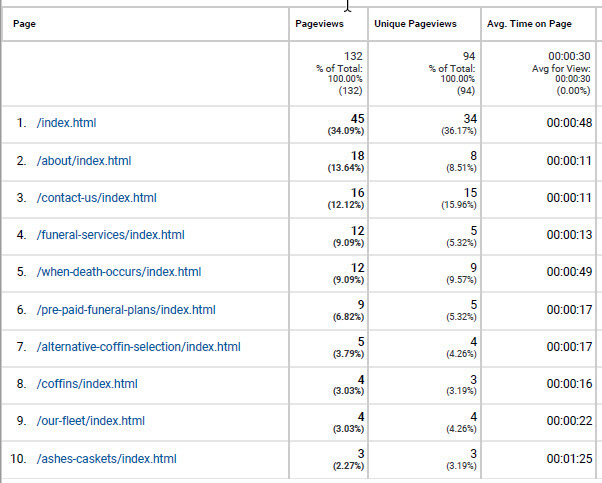 Google Analytics visitor statistics - what are visitors to a funeral director website interested in? Most visited page - Announcements. 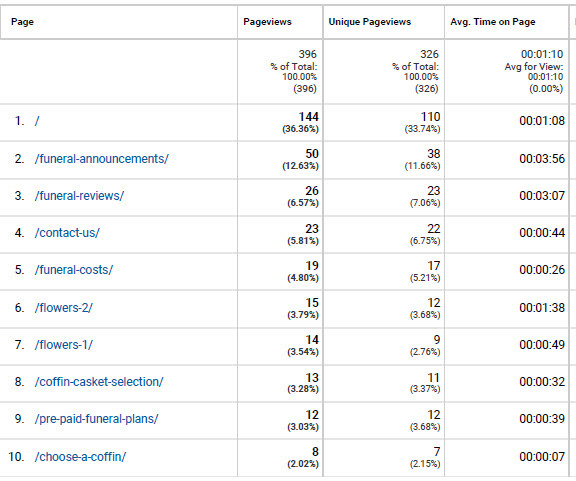 The value of a funeral announcement feature on many of our clients websites is backed up by hard numbers. In most cases this is the most visited page after the Home page and it's always in the top 3. Most visited page - Announcements. This website also benefits from the Announcements feature and the page is ranked as most popular after the Home page. In position 3 is the Contact page. Yes, people are using your website in many cases as the means of contacting you. Most visited page - About Us. Families are interested in your credentials and trustworthiness. The About Us Page always features near the top of the most visited page table and as such should be prepared with this in mind. The tone of voice and nature of content on this page is important. Most visited page - Announcements. This website represents one of our best informed and most successful funeral directors. They have an Announcements page which features at the top and interestingly they have embraced the concept of 'content marketing' with a well written blog answering every day questions. What are we all doing on the internet? All of us are consumers and our buying habits have changed drastically, in many cases without us realising. We are in a position to be much better informed about prospective purchases. Rather than contact two or three vendors of services and make our mind up based upon their proposition we now have the power to use Google to learn more about what we spend our money on and also about the people selling those services before contacting anyone. The world has changed and it won't be going back to how it was before. As business owners we can react to how our customers behave or otherwise continue doing what we did twenty years ago thus sending out a message that we don't care how they want to buy. 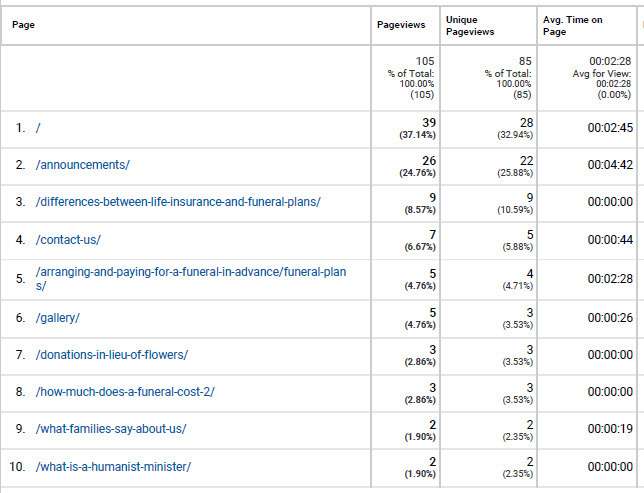 How are families researching funerals? The tables above show recent Google Analytics reports from four Funeral Director Websites clients over a one month period. Visitor numbers to a typical funeral director website may be relatively small compared to some industries however they bear a relationship to mortality rates and the number of funerals carried out in a given location over the period. As can be seen in the statistics, a well optimised funeral director website on page one of Google can expect to have at least 100 visitors per month. The majority of these visitors arrive through a search based upon either the funeral directors name or, more significantly a search based upon a town or area (i.e. 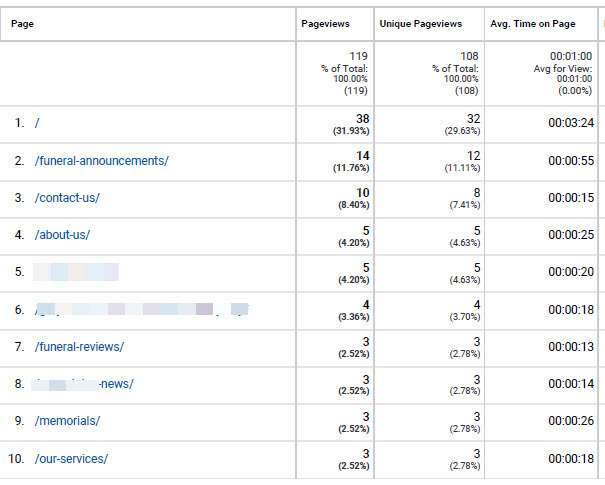 'organic visitors' as opposed to paid ads). What value would you put in terms of possible extra funerals from every additional 100 visitors to your website over a one month period? Visitor statistics demonstrate people searching online or directly visiting funeral director websites to find funeral announcements. Previously local newspapers were the 'go to' resource for this information followed by local press online announcements pages. Families and friends are seeking this information and a funeral director is best placed to provide it, the goal would be that a search containing the word 'funeral' and a name and location will bring up the relevant funeral director website. The figures above and our research prove that we are achieving this. Possibly the most compelling answer to the question of 'Why Should a Funeral Director Have a Website?' is trust. The quality of the website appearance and content reflect on the company and will be a deciding factor as to whether or not the phone call or visit to the funeral director is made. Trust is a significant factor. Is your website answering the questions people are asking Google? Those same questions you might be asked in person on a daily basis? If, on the other hand the funeral director has no website, a poor website or is not appearing in search results where does that leave them?